Pardon me while I pat myself on the back. On January 8, 2017, I made the decision to change my lifestyle. No, this isn’t some coming out notice or anything along those lines. The lifestyle change I am referring to is weight loss and weight loss maintenance. When I stepped on the scale the morning of January 8 and read the numbers “167.5”, I had the realization that 170 was becoming a future reality for me. I did not want that reality, and I made the decision to get as far away from 170 as possible. I immediately set a goal: I will get to 155.0 by March 1. The first step I took was not eating past 7pm. In fact, I made sure I brushed my teeth between 7:00 and 7:30 to ensure I didn’t eat. I realize that may sound odd, but for me, once I brush my teeth, my desire to eat diminishes. The second step I took, simultaneously with step 1, was weighing myself every day at the same time of day (morning) and writing the weight on the mirror (every day). Seeing the number kept me focused and motivated – even when the weight didn’t drop and/or increased a bit. The third step I took came into play after my husband, Rob, had to go on meds to address his high blood pressure. In an effort to help the meds better improve a change in his blood pressure, we decided to join a gym and exercise on a regular basis. Around February 11th, we joined Anytime Fitness. I had not exercised for years. Someone once told me they were on an exercise hiatus. I thought that was hysterical, and I started telling people the same thing. Since joining Anytime Fitness in February, Rob and I have been exercising regularly – at least six days a week, and with my hard work and commitment, I made my goal on March 1st, weighing in at 155.0. Once I hit 155, I wondered if I could drop to 150. I decided to extend my workout a little longer and push a little harder, to continue weighing myself daily and writing down the number, and to continue eating a healthy diet. By the middle of April my weight was 147.0, and this morning – my weight was 145.5. Today I had my annual physical, and for the first time in over 15yrs, the doctor’s scale was below 150. I was elated. In fact, I was beyond elated, because the scale showed a weight of 147, and I was fully dressed, with shoes, and it was 1:15 pm in the afternoon. Last year, my doctor wanted me to take an iron and a vitamin D supplement, because I was anemic and had low vitamin D levels. I did as I was told for a few weeks, but I slowly got out of the habit. However, when I began this lifestyle change, I started taking a Flintstones chew-able multivitamin. (Yep, Flintstones. Yep, the same multivitamin my boys take.) I wasn’t 100% certain the multi-vitamin would have enough iron and vitamin D for me, but I figured it was better than nothing. Plus, it’s way more fun to hang out with the Flintstones than it is to hang out with One-A-Day. As they say, “That’s my story, and I’m sticking to it!” I made a lifestyle change, and I am happily living it out. Good job, Lenore. Well done! My 48yr old self with my 24yr old friend/coworker. We look like we just walked off a college campus, right? Well, one of us does. I was losing weight without exercising, by simply not eating after 7pm. The weight-loss was slow but steady. When I added the exercise, the pace of the weight-loss increased, but it was still a seemingly slow process. Being patient and letting the weight come off gradually was hard, but I kept going, because I wanted to meet the goal. One doesn’t gain weight overnight – so one can’t expect to lose weight overnight. I am married, have two kids, two dogs, and two cats. Both my husband and I work full-time. We pay a total of $60 a month for our gym membership. Monday – Friday, Rob and I typically go to the gym after dinner. On Saturdays and Sundays, Rob and I will go to the gym in the morning. Adding a structured exercise program doesn’t make it an easy lifestyle for us, but the benefits outweigh the challenges. When I started my blog back in 2010, I wondered if I would ever reach a point where I felt comfortable enough to share everything about myself and my life. To date, while I’ve shared many things with you, I have not shared everything. Plus, I realize I do not need to share everything with you. My word today is ‘Snarky’. According to Merriam-Webster, the definition of Snarky is as follows: 1 : crotchety, snappish 2 : sarcastic, impertinent, or irreverent in tone or manner <snarky lyrics>. Snarky is a fitting word for today, as I continue my PMS battle. No worries, this is not going to be a rant about PMS. Instead, I am writing about the word snarky, because it is a word I hear with growing frequency. I don’t consider myself to be a snarky person. However, I am known to be sarcastic. And to me, there is a distinct line between sarcasm and snark. Be warned, I’m probably going to come across as a little sensitive in this post. With social networks like Facebook and Twitter, friendly chit-chat can to turn to disrespectful rudeness pretty quickly. The word ‘friend’ has changed with these social networks, too. One can have over 500 Facebook friends, but what kinds of people make up the over 500 friends? Are they real friends? Are they friends that you go to great lengths to stay in touch with through the years, or are they merely friends you are curious about every now and again? And, if you are snarky to these friends, do they take it as innocent and playful sarcasm? Or, do you they find it to be irreverent and rude? Frankly, do you even care how they take your comments? Truth be told, the real friends you have are the ones you interact with the most, whether it be via Twitter, Facebook, telephones, gatherings or email. And, you can check out anyone’s “Wall” on Facebook to determine which friends are real friends versus the ‘social network’ friends. I admit, I’ve had my feelings hurt by snarky ‘friends’ on Facebook. I don’t know that they meant harm; instead, I think the distinct line of snark vs. sarcasm is blurred in the world of social networks. I cannot believe everything that is said or typed on Facebook would really be said out loud to people. It’s just not how the world works. In my opinion, the reason these social networks became so successful was due, in part, to the fact that people could pretty much say whatever they wanted or felt with little to no filtering or backlash. Blogging is another example of how filters seem to evaporate, as folks spill there guts while offering their take of the world. And please, pardon me while I spill my guts, as I am an active participant of the named social networks. As a participant in social networks, I am not trying to sound judgmental. In fact, I believe a great deal of good comes from social networks. However, I worry about our filters, and I worry that our filters – which serve a respectful purpose – are evaporating at an alarming rate. Much like the Ozone layer is becoming smaller and the greenhouse house gasses are (allegedly) overcoming our Earth, our filter of respectfulness is also becoming smaller. My nieces and nephews are not aware of a world where people only communicated by corded telephones. My younger relatives are not aware of a time when you actually put forth an effort to have conversations face to face vs. the corded phone. They don’t even recall a world where you actually played outside and had to pretend to be a good guy, shooting a bad guy with the coolest stick you could find. They do not know of a world before XBox, Nintendo, etc. This younger generation doesn’t know what it is like to be patient – deliberate – thoughtful. With social networks and electronic mail, everything is instant – reactive – not filtered. And, when one is responding in an instant and without a filter, snark is sure to show itself. Sarcasm is everywhere, and sarcasm is in your face. Sarcasm is in daily face to face conversations, on television, at home with the family and online with friends. But snark? Snark seems to lurk in world where you can hide and have a sense of anonymity or carelessness. Snark is mean. Snark is personal. 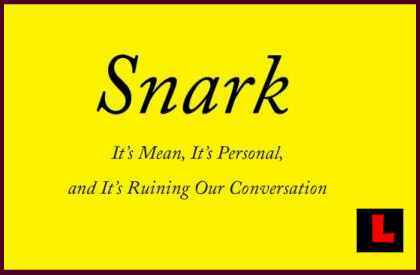 And, in my opinion, snark is ruining our conversation, even if the conversation is virtual.